2 Responses to Independence Day Recast? I thought the movie was better than that. Nevertheless, it is a fitting analog for the Obama administration. Thanks for commenting. I’m glad that you liked the movie. As noted above I thought the movie rather a paltry offer from Hollywood. I wanted to like the movie. 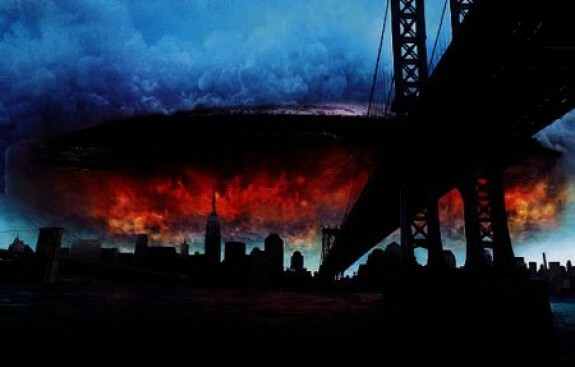 The concept of menacing aliens hovering over the capitals of major countries was a good one. Sadly, the theme wasn’t supported by good writing, meaningful characters or by dynamic special effects. The movie was hokie and because of this the speech by the movie’s president, though wonderfully patriotic sounding, was a response to a bad joke – a ridiculous setup. Another hokie movie with a promising but badyly handled underlying theme (science vs. faith) is the convoluted mish-mash called Contact starring Jodie Foster. After watching Independence Day the night before I began writing the post as a movie review. But as I was listening to news reports in the background about more government overreach and Obama’s intransigence the post drifted into political commentary. This movie is an overreach beyond quality and beyond entertainment into unredeeming alien culture.